A student at Hayes High School puts a turkey in a local resident’s van Tuesday afternoon during the Fight Against Hunger Games event. More than 125 turkeys and hams will be donated to local families, court officials said Tuesday. 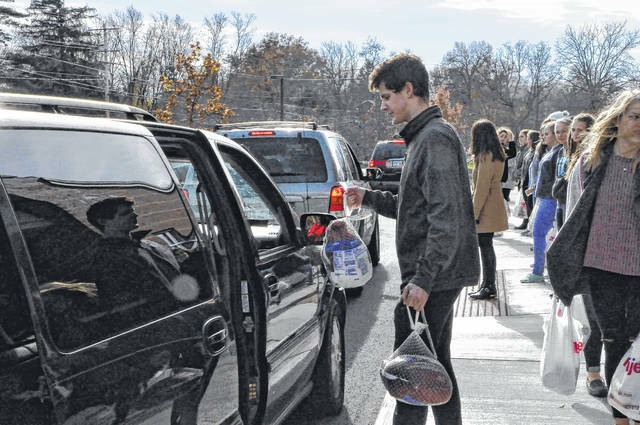 Students from Hayes High School and staff members from Delaware County Juvenile Court handed out more than 100 turkeys, hams, and other food items Tuesday morning during the third annual Fight Against Hunger Games. The games were conceived three years ago by then Juvenile Court Intake Officer Cecelia Monahan who proposed the juvenile court collaborate with Hayes High School and collect food to give to local families in need. This year, court officials and students at Hayes also partnered with the Delaware County Board of Developmental Disabilities and together they handed out 125 turkeys and hams along with mashed potatoes, bread, and stuffing to families in need. The line of vehicles wrapped around the block on Euclid Avenue in Delaware. “It’s fantastic,” said Kristina Hodge, the superintendent at the DCBDD. Hodge said Monahan now works for the DCBDD and asked if the board could get involved with the hunger games event this year. Near the end of the hour-long event, a woman broke into tears thanking the court staff for providing food for the holidays. For Monahan, that’s what the event is all about. “I hope every year we can expand it and reach more people,” Monahan said. Delaware County Juvenile/Probate Judge David Hejmanowski said the court was happy to have the assistance of the DCBDD and the school. “It’s just great to see agencies come together,” said Hejmanowski. Hayes Principal Ric Stranges said he feels lucky to be a part of the event. Lisa Williamson, the director of court services at the juvenile court, said the agencies received help from someone else this year — Lewis Center resident and Williamson’s mother, Joan Gardner. Williamson said Gardner and her husband Dan Igo spoke to Meijer in Lewis Center, which donated $200 to the food drive. Gardner and Igo donated more than $300 themselves for 20 turkeys and 20 hams. Williamson said next year she hopes the court will be able to partner with other local agencies. The food that was not handed out during the event was given to local families at several elementary schools.